Selecting a software vendor to work with is a critical decision for any organization. Being confident about a vendor's ability to deliver an effective product and timely, helpful assistance is essential for any organization, in order for them to deliver to their own customers. 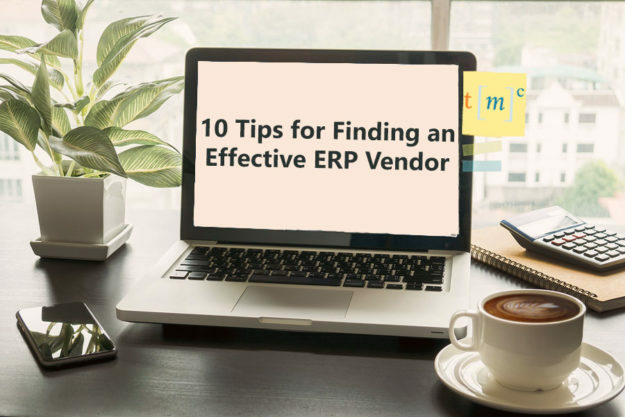 Listed below are 10 tips to help you find the ERP vendor that is right for you. Ask a potential ERP vendor for a list of references. Of course they will probably give you a list of their best clients, so take additional steps to find out more about each vendor you are evaluating. Consider hiring an independent consultant and/or tap into your industry's grapevine to learn more about each vendor. If possible, contact the references that are in an industry identical or similar to your own. Ask about the size and scope of the projects the ERP vendor typically manages for its clients. If they vary significantly from yours, it might be difficult to properly evaluate the vendor, so you might want to look elsewhere. Ask the ERP vendor if they can provide references from companies that are similar in size to your own. Chances are, you will be working with the vendor's consultants for a very long time. Ask for company references where the same consultants you will be working with completed projects for them as well. It is important to evaluate the work of the individual consultants to determine if they are a good fit for your business. Also ask about the number of consultants the ERP vendor has. If one consultant is juggling too many projects, then your service might not be as good as you need it to be. If possible, ask the reference if you can visit their organization and see the actual application in use……they should be using the product that they are selling or something is wrong. Gather your team together and prepare a list of questions before meeting with the vendor's reference. Then talk to the people who actually use the application and those who interact with the vendor. Does a particular vendor charge for every small change request? Or do they offer the type of partnership that doesn't sweat the small stuff and instead focuses only on charging for large change requests? Ask if they provide SOW’s and Change Orders for their services if different from your original agreement. 9. Does the Vendor Deliver Within Budget? Verify with the references provided to you that the vendor delivers quality changes on time and under budget, or within ranges that are acceptable to you. A good vendor relationship should last for years or perhaps even decades to come. Make sure their cultural climate seems like a good fit for your organization. Want to learn more about the different ERP options available with Microsoft Dynamics? Contact Technology Management Concepts today.